Soave is a small wine town in the Veneto region of northern Italy. The town is enclosed by its medieval walls, topped by a castle, and surrounded by vineyards producing the famous Soave wine. Soave is 23 km east of Verona, just off the A4 autostrada (you can see the castle from the autostrada). It's about 100 km west of Venice in the Verona province of the Veneto region. 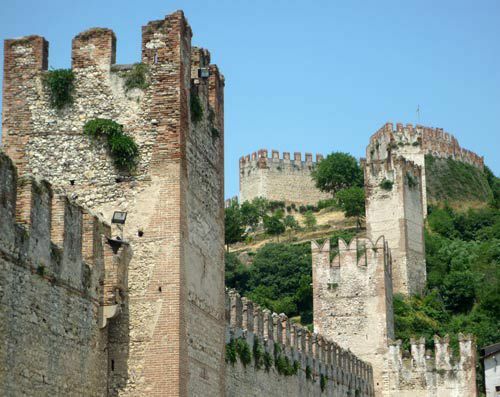 The Castle of Soave was first cited in 934 and is a typical medieval military castle. In front of the castle is a drawbridge with a gate built in the 15th century. Remains of a 10th-century church are inside the outer walls. The castle holds a museum with artifacts found during restoration and you can visit the castle rooms and courtyards where there are frescoes. Soave's Medieval Walls were built in the 13th century, surrounding the town and leading up to the castle. Originally there were three gates. The walls and main gate into town are well-preserved and there's a moat along two sides of the walls. The Palace of Justice, built in 1375, is an impressive medieval building in the center of town. Two other medieval buildings in the historic center are the Palazzo Cavalli and Scaliger Palace with nice gardens. The Palazzo del Capitano is an impressive building where many events are held. Churches include the 18th century Parish Church with 16th-century paintings, the 15th century Santa Maria dei Domenicani and San Rocco Churches, and the Sanctuary of Santa Maria della Bassanella dating from 1098 where there are good 14th-century frescoes. Wine Tasting is offered in the Cantina di Soave and at several wineries in the area. Top wine festivals are the Medieval White Wine Festival in May, Music and Wine Festival in June, and the Grape Festival in September. During summer there's music, art, and theater at the Palazzo del Capitano. At Christmas, a gigantic manger scene, Presepio gigante a Soave, is on display in the Palazzo del Capitano from December 20 through mid-January. More information about festivals can be found on the Soave Tourism site. Soave is easily reached by car from the A4 autostrada between Milan and Venice. Without a car, the easiest option is taking the train to Verona and then take the bus that goes to San Bonifacio from outside Verona's Porta Nuova train station. The bus stops in Soave near the Hotel Roxy Plaza. There's also a railway station in San Bonifacio 4 km away. Buses connect Soave to other towns in the Veneto. The closest airport is Verona, about 25 km away, with some connecting buses. Venice and Brescia are also fairly close. Bed and Breakfast Monte Tondo is a highly rated bed and breakfast in a winery outside the town walls. The 4-star Hotel Roxy Plaza is just outside the town gate. There are a few other bed and breakfasts and hotels outside of town. Several cozy, inexpensive trattorie sit along Via Roma (SP39), the main road through town. Corso Vittorio Emanuele, the other major road in the historic center, also has simple eateries and some nice shops. When choosing your restuarant in Soave, as elsewhere in Italy, follow the Italians and eat where they eat.